How to choose countertops materials for your kitchen or bathroom? We would recommend you granite and marble. Why granite and marble surfaces are your popular choices? 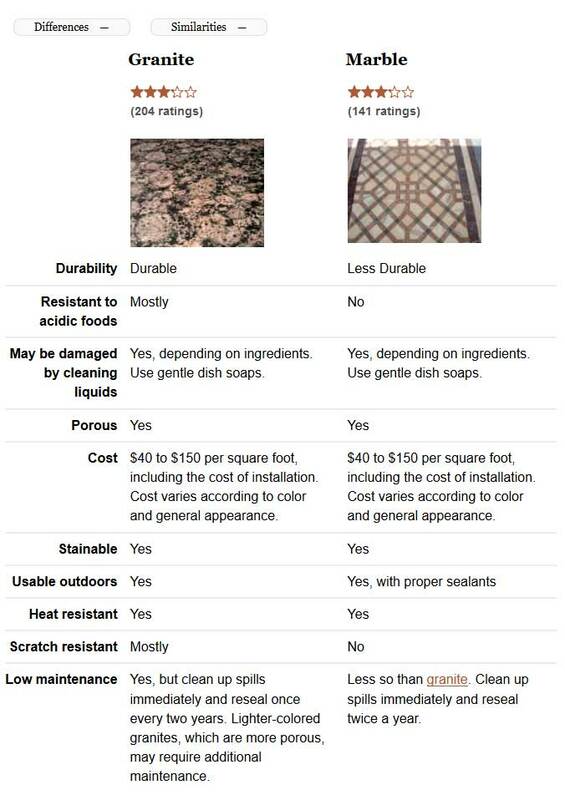 Because they are natural stones, both marble and granite surfaces are susceptible to chipping and staining. However, granite is more durable than marble and less prone to stains and scratching. For this reason, granite is often found in kitchens, while marble is more common in other areas, like bathrooms. The following picture maybe could tell you their specific differences. Granite has a variety of speckled colors resulting from the melded stones within it — namely, quartz, feldspar, biotite mica, and sometimes amphibole — and comes in numerous shades and tones. Marble is typically a solid grayish-white or cream color and has dark veins running through it, though there are other, rarer varieties that have a pale green or pink base color. The lines in marble are formed from mineral impurities, like silt and iron oxides. So the physical appearance of granite is very different from that of marble. Granite is a harder stone than marble, which lends it a shiny, glossy appearance compared to marble's dull smoothness. However, with certain polishing sealants, modern marble can be made to look much glossier than it did in the past. Granite is the more durable stone, its durable nature makes it suitable for kitchen countertops and floors. Placing hot cookware on marble may cause damage to the stone, and spilling acidic foods or liquids, like vinegar or lemon or lime juice, can dull it. For this reason, granite is often found in kitchens. However, Marble is more appropriate in some areas, like bathrooms, where it can be used for vanities, tub decks, shower walls, and flooring. Marble can create a light and unique look. Choosing right countertops materials for your kitchen or bathroom.